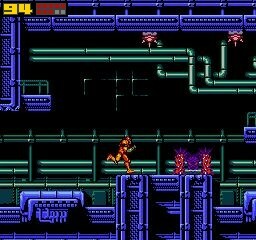 I've fixed the elevator bug, Samus could get stuck if she went back to the room with the Ice Beam. GFX compression was optimized, now the game will fit a single NES cartridge, instead of the old design that required cartridge swapping. It only takes a small 4 minute boot-up decrunching sequence, pretty fast for this ammount of data. Apparently, the custom mapper works like a charm. Now, since there's been many questions lately, I decided to group the most frequent, and answer all of them here. Project Another Metroid Other M Remake is a project that aims to bring the Metroid masterpiece that is Other M to the NES. It's being coded from the ground up in assembler and debugged via emulation. The final release will be as a standard NES Rom, along with a limited edition of gold-painted cartridges. Well, Other M is a masterpiece, as I mentioned, and one of the awesomest things it does well is to have a very complex game engine, mapped to the equivalent of an NES Gamepad and a Zapper. The game was adapted very swiftly, the only requirement is to have a Zapper plugged into the second controller port, along with the NES pad in port one. Don't worry, if you don't have a working Zapper, or a CRT television, you can enter first person mode using the select button on the gamepad, and moving a crosshair. - How about the story? The story is really important. It stands as a testament of how localization and voice direction is of extreme importance regarding design and aesthetics. 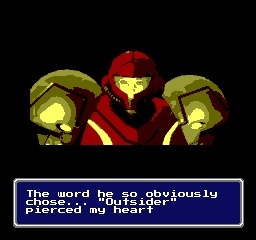 Now it'd be unrealistic to try to convert all the cutscenes to NES graphics. 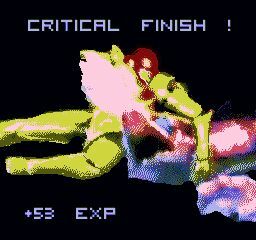 There are some animations and in-game dialog in the cartridge, but the experience is limited this way. The way I found to solve this was to include, along with the cartridge, a VHS tape with all the cutscenes. Whenever the game prompts you to play a scene, you can press the TV/VIDEO button on your remote, and play the tape with the corresponding scene. This keeps the spirit strictly retro, as it uses the technology found in the NES era. - Are there any changes to the game? Even if Other M is a masterpiece, it has room for improvement. 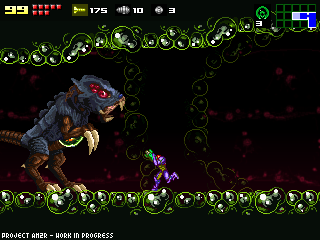 Most of the complaints from Metroid Fans come from the underdevelopment of the relationship between Samus and Adam. Now, I added radio communication in the middle of the levels, so we can hear them speaking (well, reading the dialogue) without interrupting gameplay. 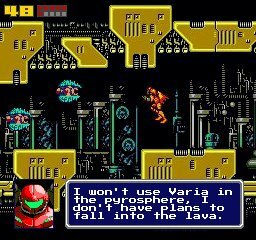 This expands the exposition of their past a lot, and helps the player make a connection to both Adam and Samus. - If there are changes in the script, will the story be better? Of course! I found it really strange to hear the words "a certain" too often, being consequence of translation from another language. So, I decided to rewrite the entire script with the use of my the expert skill of English I has master. I use text replacement to change "a certain" to "a specific", it sounds more natural. "The Deleter" was changed to "The Eraser", it now sounds 40% more awesome. Sector 0 now ejects from the facility if there is damage inside the sector AND there are living human beings inside, the original way sounded unrealistic and impractical. The self destruct sequence is called "The Exploder", and it's referenced all the time during the final escape sequence. - How limited will be the cartridge release? It'll be 50 units. All of them will have their eeproms flashed manually, and the corresponding VHS recorded in PAL or NTSC, depending on your country of origin. The cartrige is region-free, and auto-detects 50hz or 60hz refresh rates. - When is the game gonna be released? April 1, next year. Hopefully. Other M absolutely wasn't a very good game in my opinion. I really want that remake on the NES. It's funny because I still remember the joke you did last year. It is hilarious. This is beautiful. I can't wait. Well, I picked a fine time to check for updates. Though, I have to admit, I'd play the crap out of that. Start another project WITHOUT finish the previous one. Sure this remake of Other M sounds great but doing 2 projects at the same time will be a time consuming work and might eventually become an obstacle for the other part. Nice April 's fool joke! That's it, you win the April Fools contest this year. GGWP. Pure genius. Thank you. Put a smile on my face. You had me there for a little haha... Where is the AM2R download gone? its not on the usual page. Something tells me you've been planning this for a while. GOOD ONE BRO. GOOD ONE. Even if it is just a joke, I'm glad SOMETHING got posted. This place has been feeling pretty dead for a while. Nice try Doc but calling Other M a masterpiece made the prank obvious. At first I embarrassingly smiled, then I felt more disgusted as I read through the post. Brilliant satire, Doc, you're one of the few people I know who do it right. I realized it at "the expert skill of English..."
This is so obscene... Then I remembered what day it is today. Well played, Doctor. Well played. Me encantaria ver un remake de other m pero no en 8 sino 16 bits, buena broma dr.
April Fool! Okay, you almost got me. Disregard my last post. I was stupid and this is golden. I'm surpised to hear anyone call other M a "masterpiece." While I do give it credit in some areas- the gameplay is certainly good (good enough for me to have played through the game several times- I love how it feels like Fusion in 3D), the script is another matter. To give Samus PTSD and butcher her character by making her sound weak and pathetic in the face of her archenemy really upset me. Everyone regards Samus as a badass, no-nonsense woman with a good heart. I think it's awesome that you're doing this, I just found it odd to hear such high praise of a game that's been so widely panned.